These things are still true and will remain true, until humanity exists (or organic cells remain the constituent of our brain). Given the composition of a system, there is a natural size for it. Its overall balances are well maintained at that particular size. see the Reference. And I think this is the reason that decline of the Roman Empire began when it became too big and Nuclear physics provides an interesting analogy to this situation, coz you see, when we add more particles in Iron nucleus (i.e. atoms, having its weight more than Iron) stability decreases. There is one more thing we can add in this list is friendship. When you start taking friendship too big to you or your friendship has reached a level where you rely on a friend more than others, it dooms. I find another analogous natural phenomenon to the friendship or any other human relationships. 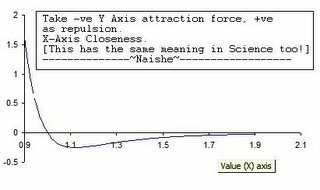 It is from Molecular physics (I donno whether molecules share emotions or not!). The curve (intermolecular potential energy curve), you see in the left, explains it. 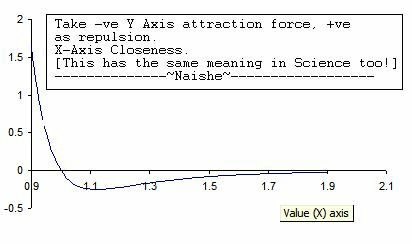 It says when two molecules (persons) come closer, attractive forces (heat in relation) increases; until certain closeness. Then attraction forces decreases (realization of defect in relation starts) and more close ness ends up into large repulsion (fight, hate, anger, emotion wrecking and obviously instability in system). A good observable thing about friendship is it always breaks when you feel closest to your friend. And if it has not broken yet, it indicates that either one of them is tolerating everything whatever other-one is doing to hurt its ego Or they are not close enough to call the other their best friend. Finally friendship is like glass it meant to break; if not today then tomorrow then why people make so much babbling when it takes place. I find it’s again very natural as it always creates a noise when you break the glass. Instead of so much blah-blah-blah (kinda boring too!) on topic “friendship”, I still believe friendship is all about forgiveness and keeping your ego down (or using brain). It makes that energy curve less steeper.